Apple’s future headquarter (called spaceship) is expected to be finished in Q4 2016. It looks like a big version of the neo-futuristic Mac Pro. Thousands of excellent engineers will have their workspace in a new inspiring environment. It’s the next architectonical level. The actual HQ is located in Cupertino, California, USA. 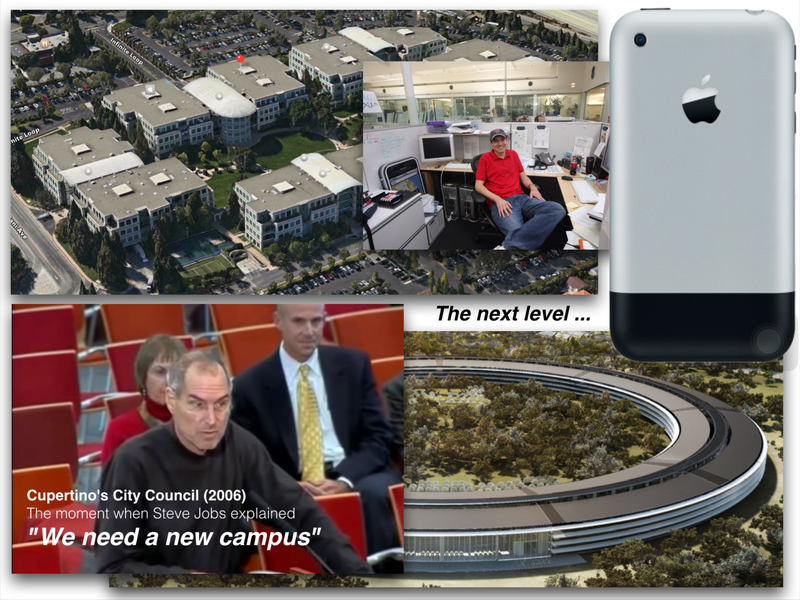 With the return of Steve Jobs to Apple in 1997 changes were made to the campus. The number of buildings were increased and many activities not related to research and development were moved to the buildings on Infinite Loop 1 (hopefully not an omen for any further operating system). Tradition has it that Steve also increased the menu of the cafeteria drastically. Steve Jobs’ dream of a futuristic new workspace will be the perfect environment to successfully keep the company as the epicenter of technology in the Silicon Valley. It happened in 2007. The first iPhone (the collage, created with Apple’s iWork app Keynote, shows this device, the so-called iPhone 2G) was released and today it generates 56% of the company’s revenues (101,991M$ of 182,795M$ total net sales). I’m sure that we wouldn’t see the spaceship if Apple would only offer fashionable products instead of bringing consistent innovative iterations of hardware and software products as well as powerful services. In 2016 Apple will move into the next architectonic level. It will be exciting to see what the next level of devices and operating systems will be. Sad to say that the unforgettable Steve Jobs will not see his spaceship. 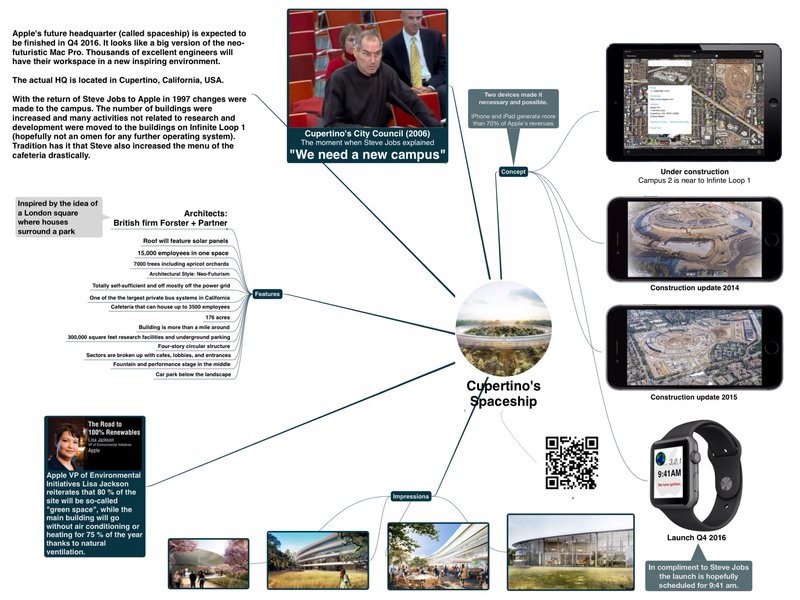 Readers of my blog already know that I like to summarize information by visualizing it woth a mind map. So here is the map about Apple’s spaceship. Waiting for the spaceship to land.